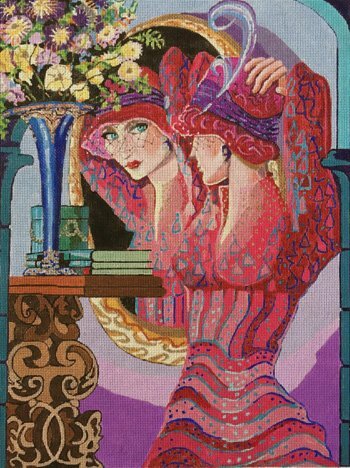 Emerald Eyes needlepoint design by Brazilian artist Otto de Souza Aguia shows a 19th century woman and her reflection. It is offered by Purple Palm designs. The needlepoint canvas of a 19th century lady measures 12" x 16". The 19th century lady design by de Souza is handpainted onto 18 mesh mono needlepoint canvas and is best suited to the intermediate level stitchers. Emerald Eyes needlepoint canvas can be purchased with or without fibers. If you select cotton we will send DMC cotton floss. For Silk we use Pepper Pot silks which are single stranded and easy to use. If you choose Mixed threads, we will send a mixture of silk, cotton and Glisten by Rainbow Gallery to add a bit of sparkle to your canvas. We recommend you use a pair of 16" and a pair of 20" stretcher bars and some thumb tacks to keep the canvas taut.